Fight nighttime diaper leaks, reduce diaper changes, and save money with our super-absorbent Sposie overnight diaper booster pads. Our diaper-doubler booster pad simply inserts into your baby's diapers or pull-ups to put an end to diaper leaks. Our soft and plush flow-through pad is designed to wick away moisture reducing discomfort and skin irritation caused by excessive wetness - keeping your toddler's delicate skin dry, comfortable and rash-free. 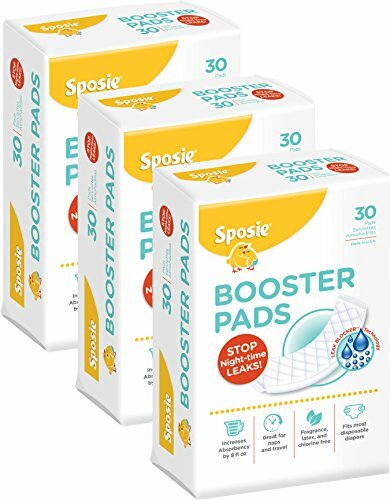 Sposie booster pads will leave your child feeling dry and comfortable all through the night. Sposie pads offer adjustable positioning for boys or girls. Made with the highest-quality materials, Sposie Boosters are hypoallergenic, pediatrician and dermatologist tested, and completely safe for your baby. Sposie diaper pads turn any diaper into an overnight diaper by adding extra absorbency to your child's diaper. Our diaper inserts work well with most brands and sizes. If you have any questions about this product by Select Kids, contact us by completing and submitting the form below. If you are looking for a specif part number, please include it with your message.